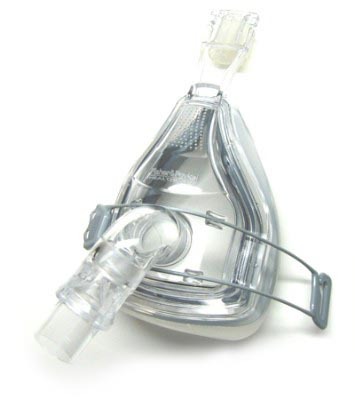 The Large FlexiFit HC432 Full Face CPAP and BiPAP Mask from Fisher Paykel Healthcare continues the tradition of the FlexiFit 431's under-the-chin design, but offers some significant improvements with the addition of a soft foam inner cushion in addition to the silicon outer cushion. Like the 431, the FlexiFit 432's under-the-chin design provides increased stability to the entire mask, allowing it to maintain an effective seal even with jaw movement. Additionally, the 432 also incorporates all of the advantages of the rest of the FlexiFit line, such as the advanced diffuser system, easy-to-use headgear, and unique glider mechanism. This mask is also available in several other sizes. 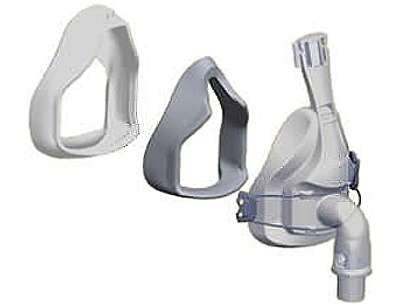 Complete large mask with headgear assembled & ready to use right out of the package. Includes 1 Large Silicone Seal and 1 Large Foam Cushion - this new "double seal" improves stability and helps to achieve a more robust seal with less pressure on the face. Highly contoured Silicone Seals with a large range of nasal bridge movement provie comfort and security. Glider mechanism creates stability and allows the headgear to move independently of the mask when the patient changes sleeping positions. Improved air diffuser system provides a quieter mask and prevents air from blowing on the bed partner. The Crown Strap headgear, combined with the under-chin design, provides extra stability and eliminates the need for a chin strap. This mask can be a good solution for male users who have beards. Silicone Seal and Foam Cushion for the Fisher & Paykel 432 Full Face Mask.